Is sugar addictive? How about artificial sweeteners? Researchers have been investigating these questions for years. What they have found is that sugar can trigger neurochemicals in the brain which make us feel “happy”, and for those with certain genetic predispositions, sugar can make us feel REALLY happy - can actually be addictive. How does sugar addiction work, and how does it occur? Sugar creates a ‘bump’ in the feel-good brain chemical dopamine in the reward center. This sweet food stimulates a “happy response” in the brain whenever sweets are eaten. The brain remembers this “happy response” and wants more sugar, more often, to repeat the good feeling. For those predisposed to sugar addiction, over time the brain becomes desensitized, so larger amounts are needed to feel satisfied. A sugar addiction will cause binging, withdrawal, cravings, and may even increase drives for other addictions. Like any other addiction, when sugar is removed from the diet, the body can go through withdrawal symptoms such as anxiety, reduced will power, impulsive behaviors, hopelessness, depression, cravings, and relapse. High sugar consumption over time, especially when paired with high fat foods, often leads to a cascade of other chemical problems in the body, most notably a problem called metabolic syndrome. People start to notice belly fat weight gain, and that can be a signal that insulin resistance is occuring, which then can lead to prediabetes, high blood pressure, high triglycerides, inflammation, hormone problems such as PCOS, and more. People may try to go on a diet to try to reverse these problems, but , but when withdrawal symptoms appear, that’s when dieters often give up. The symptoms are so depressing and frustrating, that without help, they can derail the best intentions. When sugar is consumed, it has been found to cause a pleasure or reward-response in the brain. The pleasure center of the brain signals dopamine, the 'happy' neurochemical, which then signals motor movements (reaching for another cookie!). With long-term sugar consumption, researchers have found that gene expression changes, increasing concentration of excitatory dopamine receptors while reducing the concentration of inhibitory dopamine receptors. In addition, dopamine released with sugar consumption is tolerated more and more by the body; as dopamine fluctuations increase, the brain starts to resist it. Over time, increasing doses of sugar are needed to activate the pleasure center of the brain. Tasty, hyperpalatable foods that trigger this pleasurable reward-response are usually calorie-dense, high glycemic index, rapidly digested carbohydrate, and high in saturated fat. These food components are addictive, causing a reward-response in the brain, and the body wants more of that reward/pleasure-response ASAP! When these trigger foods - sugar, white flour, calorie dense, and high saturated-fat foods - are consumed regularly, it can become hard to eliminate them from the diet. This chain of events can be hard to fight, and can make it extremely difficult to reach a healthy weight goal. We can help you avoid the addictive response to sugar and other addictive foods by helping you recognize the difference between hedonic and homeostatic hunger. Homeostatic hunger occurs when you haven’t eaten for a few hours and you sense that your body needs food (stomach hunger); it is the body’s actual need for food as FUEL. Hedonic hunger, on the other hand, is the desire to eat because it is enjoyable, and it will be a source of FUN (heart/head hunger). Hedonic hunger is controlled by the reward center in our brains, and many different factors can increase or decrease our neurochemical drive to “eat for fun”. There is nothing wrong with enjoying food - but - there is nothing fun about feeling out-of-control, or feeling controlled by excessive hedonic hunger signals. The good news is that research has revealed many strategies to bring hedonic hunger under control. The first thing we need to know is that the two types of hunger can interact: If you do not meet your needs for food as fuel (homeostatic hunger), then the drive to eat for pleasure may be driven up as well (hedonic hunger). Hedonic hunger can be driven too high, which leads to overeating. Eating meals and snacks on a regular schedule (and not going too long between meals), and eating meals with a healthy balance of protein and other nutrients will help BOTH types of hunger. The next thing we need to know is that excess exposure to high glycemic carbohydrate/high fat foods also drives up hedonic hunger. Even seeing or smelling these ‘trigger foods’ can increase our drives to ‘eat for fun’. Eating excess sugar is a powerful trigger for these out-of-control dopamine surges in the reward center of our brains. Interestingly, artificial sweeteners do not trigger the dopamine 'reward' response in our brain the way sugar does! For those who love sweet tastes, and are are sugar-addicted, but are not ready to cut all sweetness out of their diets, there IS a way to come down off a sugar addiction without going ‘cold turkey’. “Products with artificial sweeteners such as sucralose may be used as a 'step-down' strategy for those who are sugar/sweet-addicted, since the products will still taste sweet, but NOT trigger addictive chemical brain responses - sort of how like alcohol-free beer TASTES like beer, but can be consumed safely by alcoholics.” (Warren, 2015) In a comparison of desire for real sugar, artificial sweetener, or water, the impulse over time for sugar was significantly greater than both artificial sweeteners and water, which were much less desirable. “Some of our patients are worried that artificial sweeteners will simply continue a sugar addiction. Research suggests that this is not the case, neurochemically. For those who are genetically predisposed to sugar addiction, the consumption of sugar creates addictive symptoms of cravings, impulsive eating, anxiety, and binging, as well as neurochemical changes in the brain which worsen the cravings over time. Artificial sweeteners do not appear to cause this addictive brain change. A patient may choose to stop all sugar and sweeteners, ‘cold-turkey’ if you will, or if they prefer, they can choose to break their sugar addiction through judicious use of some calorie-free sweeteners. Once they remove the sugar, they will not experience the sugar-induced dopamine surges and crashes, even if they are using calorie-free sweeteners, and their addictive response will be extinguished. They will experience increased control over their food consumption. They may ultimately decide to discontinue all sweeteners, and over time their taste preferences will change as well. Those who are addicted to sugar can feel trapped - they may feel they need it to feel normal. When sugar is abruptly taken away, withdrawal symptoms come on, and dieters often give up. Sugar withdrawal can derail the best of intentions. This is where our program becomes highly beneficial, with use of research to help control cravings while working toward a healthy weight. “In our program we will help you remove and replace addictive substances, create a healthful, realistic nutrition plan, activity and exercise strategy, provide continuous support, accountability, stress management tactics, problem solving, counseling, and education - and re-education - along with the latest research. We have the tools to help break food addictions, while also retraining the brain to prefer, or even crave, healthier foods. We also have the option of using medication to help control withdrawal while patients are building new lifestyles, creating and solidifying new habits, new healthy lifestyle patterns. While medication is certainly not necessary for weight loss, some people find it to be an incredibly helpful tool, as an adjunct to lifestyle change - never a replacement for healthy lifestyle, of course. Medication may help maintain abstinence in some cases as well. For certain patients, we use a method similar to the Finnish Sinclair Method for alcohol addiction, which uses medication on a ‘prn’ or ‘as needed’ basis to help block re-activation of addictions, for those with serious addiction. But the bottom line is that new healthy lifestyles ARE possible to achieve, and maintain. And feel free to give us a call, anytime, for help in designing your healthy life program! http://www.ncbi.nlm.nih.gov/pubmed/21243471 Stice, E., Yokum, S., Zald, D., and A. Dagher. 2011. Dopamine-based reward circuitry responsivity, genetics, and overeating. Curr Top Behav Neurosci. 6: 81–93. http://www.ncbi.nlm.nih.gov/pubmed/20116437 Stice, E., Yokum, S., Bohon, C., et al. 2010. Reward circuitry responsivity to food predicts future increases in body mass: moderating effects of DRD2 and DRD4. Neuroimage. 50(4): 1618–25. http://www.ncbi.nlm.nih.gov/pubmed/19014506 Blum, K., Chen, A.L., Chen, T.J., et al. 2008. Activation instead of blocking mesolimbic dopaminergic reward circuitry is a preferred modality in the long term treatment of reward deficiency syndrome (RDS): a commentary. Theor Biol Med Model. 5:24. Review. How does adding high fiber foods work to help weight loss? Probably by several mechanisms: 1) adding higher fiber foods ‘crowds out’ unhealthy, calorie dense foods. In other words, if you eat enough salad, you won’t have room in your stomach for cheeseburgers and French fries! 2) Creating a sense of fullness/satiety. If you feel more full, you won’t be as likely to overeat calories. This approach is also known as ‘Volumetrics’. 3) Higher fiber foods create a ‘low glycemic’ effect - controlling post-prandial (after meal) blood sugar levels. 4) Higher fiber foods may limit absorption of some calories, and may also lead to lower inflammation - there is ongoing research in this area. If would like help designing a healthy, sustainable high fiber diet, and adding this to part of your comprehensive healthy lifestyle, we can help. We are availble to help in-person, 1:1, and via our new Virtual Visits (via phone, email, or skype) as well. Keeping a food journal is, in fact, an excellent tool for achieving nutrition related goals! It tracks food consumed along with the calorie and nutrient count of each. In nutrition counseling, these journals are used to track past eating habits, modify a nutrition plan, and increase self-monitoring to attain a goal. Journaling was found to be great for self-management because one can see how food choices are affecting goals at the end of the day; when looking at your journal you can see that certain foods are either in alignment with the goal, or could be modified here and there to create the desired results! Research studies found an individual’s motivation to lose weight combined with knowledge of what to eat are NOT enough to maintain the initial motivation for change long-term. Weight loss is very difficult and regain can be very common; the most powerful predictor of weight loss was the amount of journaling done each week! This is because journaling enhances accountability and awareness of current behavior. Additional planning ahead, small goal setting, and overcoming resistance are keys to changing a behavior 2,3. One study evaluating self-monitoring behaviors related to weight loss found those who journal the most over a 6 months period lost significantly more weight than those that journal the least. Individuals counting calories and/or measuring food most days of the week also experienced greater weight loss. Skipping meals and eating out for lunch, on the other hand, were associated with less weight loss. Furthermore, the amount of journaling done in the first 18 weeks of a program was directly associated with amount of weight lost and there was increased adherence to journaling with use of an electronic device. So in conclusion of the study, eating out less, eating at regular intervals, and using a journal are effective weight loss strategies 5. Speaking of electronic devices for food journaling, the use of mobile electronic devices was significantly effective in weight loss, in another research review 4. Text messaging, personal digital assistants (PDA), and weight loss phone apps were compared to written diaries; those that used mobile phones had a significant and consistent benefit with respect to weight loss. Weight loss apps had an especially strong influence on the total results with a particular benefit on weight loss 4. Journaling creates self-awareness of eating habits because of the ability to look back at what has been successful or unsuccessful. Journaling also helps with planning. As you are journaling throughout the day, you can see how many more calories are left for the rest of the day, and plan accordingly. This really is an excellent tool for weight management that can be tailored to your preferences. Using apps like myfitnesspal are excellent for journaling. Calories and nutrients are calculated for you and much of the work is taken out of your hands. In addition to the ease of an online application, it can include support through online counseling. This allows the nutritionist to identify problems and strategize solutions through assessment of the food journal. Amy Buzzell has a Bachelor of Science degree in in Nutrition Science from the University of New Hampshire, and an M.S. in Clinical Nutrition from the New York Institute of Technology, and was awarded membership in the Alpha Eta Honors Society, the National Honor Society for Allied Health Professions. Amy is also a certified Personal Trainer by the ACSM and the AFAA, has completed Kinesis Training, Next Level Performance Series Dynamax and Kettle Bell Training, and has been certified by the FPTA Fit-Pro Personal Training Academy by Dave Parise, and Latitude Fitness. Before working with us at Physicians Healthy Weight Center, Amy had extensive experience designing and running her own personal training program. Patients can visit Amy at our North Hampton and Dover offices. If you need assistance with journaling, food planning, exercise, and practical strategies for both short AND long term success, feel free to call. We're here to help. (603) 834-3087. Metabolism: exercise helps keep our basal metabolism strong while we lose weight. If we cut calories, and do not exercise, our metabolism SLOWS down. Exercise can help compensate for this. Muscles: exercise helps make sure we lose FAT, not excess MUSCLE while we lose weight. If we don’t exercise while cut calories, our body burns up too much muscle for fuel. Exercise help us burn the fat, save the muscle. Mood: exercise helps keep us in a good mood, and serotonin levels high. Some studies suggest exercise can work as well as prescription antidepressants for our mood! Motivation: exercise helps us feel good - physically and mentally. And when we feel good, we feel more motivated to make healthy food choices, too! Exercise helps us feel energized, healthy, strong, and capable! Maintenance: 94% of people who successfully lose weight - and KEEP it off - report that they exercise almost every day (these are the ‘super-losers’ who are part of the National Weight Control Registry study.) So while exercise is helpful during weight loss, it is CRITICAL to help us MAINTAIN weight loss. Might as well get started with exercise during the weight loss process, since we’re going to need it later to keep weight off! Medical: there are numerous medical benefits that come with regular exercise - cardiac health, control of blood sugar/insulin resistance, improvement in blood pressure, bone health, lower cancer rate, improved mental health and mood, anxiety control, improved sleep quality, and more. Exercise can help us ‘shrink belly fat’ - which helps control metabolic syndrome and inflammation that arises from excess belly fat stores! Remember to start gradually, and build up gradually. Of course check with your primary care provider (or us at a visit) to help you choose the best exercise for you, given your health, preferences, and lifestyle. Diet vs. Exercise for Weight Loss - which is more effective? When it comes to weight loss, which is more effective - diet or exercise? Of course BOTH diet and exercise are important for overall health, but when it comes to weight loss, it is important to look at the actual numbers. People also often tend to overestimate the calories burned through exercise, and then assume they’ve ‘earned’ a ‘treat’ - and then consume extra, excess calories. According to research, “individuals overestimate EE (calories burned during exercise) by 3-4 folds. Further, when asked to precisely compensate for exercise EE (calories burned during exercise) with food intake, the resulting energy intake is still 2 to 3 folds greater than the measured EE (calories burned) of exercise.” http://www.ncbi.nlm.nih.gov/pubmed/21178922 (J Sports Med Phys Fitness. 2010 Dec;50(4):377-84. Since most people underestimate their calorie intake, and overestimate their calories burned, journaling with an app like MyFitnessPal, or using a tracking device such as a Fit Bit, can be a real eye opener! But even using good old pen and paper to track calories and exercise can be useful. To find the calories in food, try an online source, or book such as the Calorie King. To estimate how many calories you burn, there are online tools: http://www.exrx.net/Calculators/CalRequire.html This includes an estimation of calories burned at complete rest (BMR or Basal Metabolic Rate), plus calories burned through normal daily activities (NEAT, or Non-Exercise Activity Thermogenesis), plus extra calories burned through intentional exercise. But remember, exercise helps keep your muscle AND metabolic rate strong while you lose weight, and provides numerous other health benefits. So don’t skip the exercise, but don’t expect it to yield substantial weight loss all by itself. And if you need help calculating the proper calories to lose weight, given your lifestyle, just ask us! We can help make it simple. 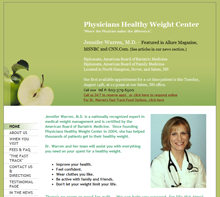 http://www.physicianshealthyweightcenter.com/ (603) 379-6500. We are now offering online counseling, for extra help, and to help those who who live at a distance.